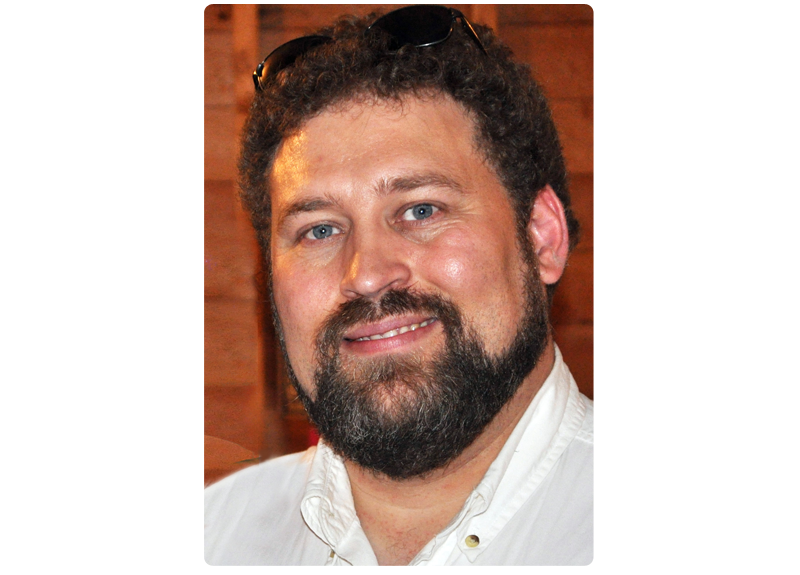 It's time to be making preparations for fall fertilization programs, but before you begin it is a good idea to take a good look at your current crop. 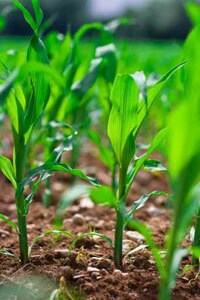 This month we will focus on corn production and some of the common problems I have seen in my travels this summer. It is never easy to assimilate all of the things you need to know to put a fertility program together for a successful crop. From what I have seen on my travels so far, many of you need to practice " see what you look at "--a famous quote of Dr. Reams. I am amazed at how so many farmers across this nation have lost their sensitivity to the things of nature. I think so many of you are so wrapped up with government programs, chemical selection and financial planning that you have lost your ability to really farm. The corn many of you raise is a long ways from what it should be even though you may have good yields. 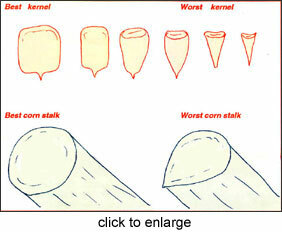 The kernels are shriveled, low in mineral content, and often mold easily. When I walk fields in many areas of the country, the ground is very hard where it is dry and very sticky and mucky when wet. I think it is time many of you learn what a truly healthy soil should feel and look like and what good corn should look like. Good healthy soil in a corn field should feel like walking on a thick, plush carpet. I also notice the amount of insect activity the moment I enter a corn field in August. 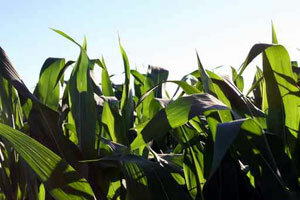 A healthy corn field will have few if any damaging insects. A stressed, unhealthy field will have millions of insects flying about. Another thing I readily notice is the heavy chemical odor in many fields. A healthy field has a sweet, earthy odor. Too many of you don't know the difference because you haven't spent enough time in different fields to know that there is a difference. The other problem for many of you is that there are so few healthy fields that you don't know what to look for and can't "see what you look at." The corn stalks in August be round and not tear-drop shaped. 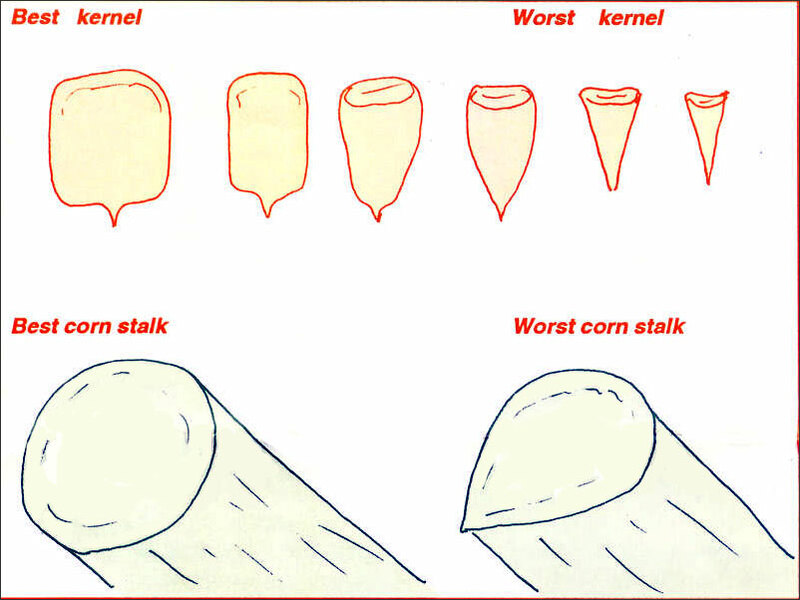 The lack of roundness indicates a problem of calcium availability early in the season, Often teardrop stalks are weak and very susceptible to breakage and disease. August is also is a good time to check ear ends to see how well the ears are filling at the ends. It is generally considered true that poor end filling is indicative of a potassium shortage. I am not sure this is always the case, because different varieties in the same field with similar maturity dates and planting dates don't always show the same problem. I think calcium may have a role in ear-end filling, because I knifed in 5 gallons of liquid calcium on my farm and left a check strip and recently checked the two areas. I found that the ears were nicely filled out in the sidedressed area and poorly filled in the non-sidedressed area. Poor ear-end filling is very common in my area this year. I don't think it is a potassium problem as much as an Ergs problem. We have had way too much rain this growing season and I think it is a lack of energy at ear filling time rather than a lack of potassium. I check the Ergs reading at lay-by-time and found a reading of 60 which is way too low for good corn growth and ear set. The corn field I am referring to has had more than 18 inches of rain since planting time and I believe the poor ear filling is from the loss of nutrients due to leaching from excessive rain. This caused the Ergs to drop way too low. The area I sidedressed with 5 gallons of liquid calcium is maintaining around 250-300 Ergs and the ears are much fuller and bigger around than the control area. I was only able to get 10 acres sidedressed in the 50 acre field due to the weather. I took some 25 acres of the field and had 10 pounds of 20-20-20 dry water soluble flown on and had a short term response. Some ears started to fill at the tip ends after aerial spraying on the mix but I should have put more on or repeated the mix in 10 days to get the necessary results.I wish I had done at least part with a second spraying see how well it would have worked. My problem is like many of yours, I was too busy doing other things and not paying enough attention until it was too late. The main reason I didn't follow through was because I was in Pennsylvania for two and a half weeks -not checking my crop but checking fields for others. The area that I aerial sprayed in late June showed up quite well in early August after I got back from Pennsylvania. You could really tell on the ear ends where kernels had started to fill and then ran out of Ergs again. The soil is very low in humus as is most soils across this country and that makes it difficult to hold a good Ergs reading in the top six inches of many soils. This is especially true when you have a lot of rainfall. The way it looks now, I sure wish I could have liquid calcium knifed in on all the acres, because I think will be 20-30 bushels more where I knifed it in. I think the low Ergs in fields I have tested on my trip led to many fields being hurt by corn borers. Corn borers are a significant problem in a great number of fields this year because the dissolved solids in the plants are way too low to protect the plant from borer infestation. If the dissolved plant nutrients in the soil are not there, so the result with be insects and disease - more root, worm damage, stalk rot and fungal disease. I have accounts who have kept the Ergs up above 200 so far this growing season and we are hoping for a 200-plus bushel corn crop. I have checked the field in mid-August and it sure looks like we should. These soil analyses are from four corn fields in central Ohio. I walked these fields in late July and can assure you that soil compaction was a real problem. The soil lacked humus as well as calcium, phosphorus and nitrogen. The phosphorus should have been at least 150 pounds and the calcium readings 2000 plus. The nitrogen should be at least 40 pounds between the two categories and better at 60-80 pounds total at this time of the year. I have seen low NPK numbers and still people have a very good crop yield-wise but not quality-wise. The real problem here is a low Ergs reading; every day the Ergs stay below 150 you are losing yield. In fact, in low humus soils you may need to maintain 300-400 Ergs in order to get a good crop. The soil in this case is so compacted that the aerobic microorganisms cannot establish. This alone makes it difficult to maintain an Ergs reading unless you use a lot of salts. The extensive use of salt-based fertilizers destroys the humus so it is quite a balancing act to improve humus content and Ergs at the same time. The other complicating factor is the use of herbicides on low humus soils. I am more convinced than ever that herbicides do a lot of damage to the soil that we don't completely understand yet. I recently looked at a soil that had a lot of herbicides used on it and had two tons of compost applied for two years and still "could not grow grass or maintain a crop. The owner tried to establish a cover crop on soils and after each application of compost, lime and soft rock phosphate the cover crop would start to grow for several months and then die out. It looked to me that the chemical had built up in this soil so badly that it kept killing out the cover crop and the microorganisms in the compost. Soils like this call for several heavy applications of RL-37 to neutralize the chemicals so this program can work. RL-37 has the ability to neutralize many herbicides so they don't harm the growing crop. I use this product a lot in many areas to get oats to grow on soils where herbicide use has been heavy. The four soil samples in this newsletter probably need at least one gallon of RL-37 to get them straightened out so things will happen. RL-37 neutralizes many herbicides plus acts as a soil conditioner. This addresses two major problems with these four soils; chemical neutralization as well as soil aeration. Once these two problems have been solved, then maybe we can find out what is really lacking in this soil and take corrective action. Next I would consider applying compost, high quality ag lime, and soft rock phosphate blended together. Apply 500 pounds of this blend in the fall on top of the ground and do not till it in. Then in the spring, I would use 35 gallons of 28 percent nitrogen, 5 gallons of Thio-sol, and 2 quarts of Z-hume to get this soil back into production. Using aeration equipment would be helpful in a soil like this due to the extreme compaction of this soil. The narrow ca1cium:magnesium ratios and reversed phosphorus:potassium ratios seriously affect soil aeration. Insufficiencies in three areas can really hurt quality corn production; humus, phosphorus and calcium. The blend outlined above addresses each of these parameters and hope- fully turns this soil back into a top notch producer.